Health care providers are searching for methods to improve patient satisfaction. A hospitaiwide survey at our institution studied 2 years of our patient satisfaction data, which indicated that problems with communication between caregivers, notably physicians, and their patients are a major driver of dissatisfaction with clinical care. Patients can see upwards of 20 physicians in a day, leading to confusion, frustration, and unanswered questions regarding their care. This creates a barrier to communication between physicians and patients, potentially worsening patient care. As part of a rigorously studied service excellence program to improve the patient experience, our institution implemented tools to help improve patient interaction and foster effective patient‐physician communication, one of which was the Teamcards project. To help patients know which physicians are caring for them and to improve communication between the physician and the patient by using a picture identification card. 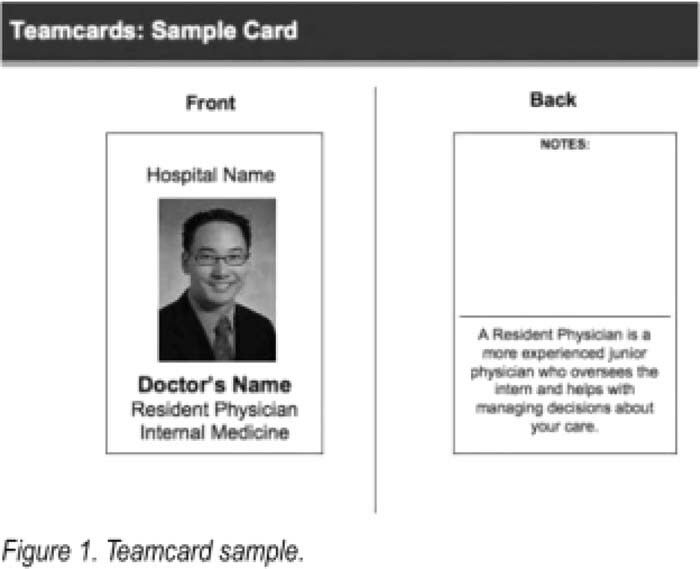 In an effort to improve patient‐physician communication, the Teamcards project was initiated. The goal of the project was to improve a patient's identification of their primary treatment team, facilitate communication between the patient and her physicians, and to improve the understanding of the roles of Ihe primary treatment team. The Teamcard consists of each physician's name, picture, and title on the front. On the back is a description of the physician's role in easy to understand Terms (see Fig. 1). Teamcards were distributed To members of the internal medicine teams, including attending physicians, residents, interns, and medical students. Cards were distributed to patients on the day of or morning after admission on selected general medicine floors participating in the pilot study. When distributing the card, Ihe team member was scripted to introduce herself and the card and to ask if the patient had any questions. A survey was developed lo determine the efficacy of the initiative and distributed to patients during their admission. We implemented Teamcards, a picture‐based identification card with easy‐lo‐understand defnitions of medical roles, in order to improve patient satisfaction. Teamcards helped patients identify their physicians, facilitated communication and addressing of questions, educated patients about the academic medical structure, and had an overwhelmingly positive reception from patients. Our initiative demonstrates the ability tc improve patient‐physician communication, a major driver of patient satisfaction and quality of care, with a low cost and a simple intervention. Leo T, Shieh L. Teamcards — Improving Patient‐Physic Ian Communication with a Picture. Abstract published at Hospital Medicine 2010, April 8-11, Washington, D.C. Abstract 177. Journal of Hospital Medicine. 2010; 5 (suppl 1). https://www.shmabstracts.com/abstract/teamcards-improving-patientphysic-ian-communication-with-a-picture/. Accessed April 25, 2019.